In 2013, the “carbon hype” in the automotive industry reached a peak when BMW presented an electric mega-city vehicle, the i3, with a fully carbon body. At that time, EVs and stricter CO2 targets were expected to bring the breakthrough for carbon fiber cars. However, five years later, applications for carbon composites are still lacking in mass-market passenger cars, and OEMs have shifted focus back to light metals. Carbon parts still struggle to meet the industrial and economical requirements of car manufacturing. However, new manufacturing processes, chemistries and vehicle designs are preparing the ground for a rebound of carbon composites. China is investing heavily in R&D and manufacturing capacities for automotive carbon composites, while innovative players in Europe are silently preparing to ride the next “carbon wave”. Why did the hype not lead to more carbon cars? Big words and big investments – in autumn 2011, during the opening of the new $110m carbon fiber plant in Moses Lake, WA, BMW CEO Norbert Reithofer stated that carbon fibers would become the key automotive material in the future, changing the way cars were designed, developed and produced. Seven years later, we see a different picture. BMW divested from its JVs with SGL in Wackersdorf and Moses Lake in 2017, and mass-market cars with carbon body structures did not materialize. The BMW i3 is still the only car with a significant amount of carbon composite content and production volumes above 10,000 units per year. One reason is that originally the heavy battery systems of EVs were expected to require carbon to lower weight and extend range. However, all recent BEVs from Tesla, Jaguar, Audi, Porsche and Mercedes have aluminum body structures, or at least multi-metal lightweight structures that are aluminum heavy. Research by the Center for Automotive Research (CAR) in Germany indicates that ranges of EVs benefit less from weight saving in comparison with conventional cars, e.g., due to energy recuperation. In the study, a Tesla S with empty weight of 2,155 kg had increased energy consumption of only 0.6 percent with 14 percent extra load (300kg). Although extreme lightweighting is less important than was originally expected, two major limitations for the mass market remain: cycle times and high end costs. Improved manufacturing processes have not yet led to cycle times much below five minutes, which means that even with a two-shift operation, 50,000 units per year is the limit for one production line. Thus, applications are reduced to “super sport”-, luxury- and high-class premium cars with low volumes, such as the BMW 7 Series and Audi’s A8. Moreover, in these segments, weight-saving in the right place has positive effects as perceived by the driver. Even more important are the enormous costs: resin transfer molding (RTM), with its entirely automated preforming process, is likely the most advanced production process today. This is used for the new Audi A8 rear wall and realized with Voith’s Roving Applicator technology. Applying direct fiber placement technology to preforming reduces scrap rates from 40–50 percent to almost zero with RTM. According to experts, this lowers component costs to approximately €40/kg. ZAX: A carbon fiber plant with annual capacity of 5,100 tons of fiber and a 15,000 ton precursor (€600m investment). KDX: An R&D center in Munich in cooperation with the Technical University of Munich (€30m investment). KDX-Roding: Its Europe Automobile Design Center in Munich, in cooperation with Forward Engineering. KDC: an Industry 4.0 plant with an annual capacity of 1.5m carbon fiber parts using HP-RTM, Surface-RTM, WCM and CF-SMC (€400m investment). Cooperation with Fritzmeier for tooling and mass-production support. Strategic partnership with SGL for material support. In addition, Kangde Group announced that it had co-invested in the Kangde Carbon Valley Technology project together with Kangdexin Group and Province Government to achieve an annual output of 66,000 tons of carbon fiber when in full production by 2023. This capacity would equate to 1.5 times the current annual output of industry leader Toray and could be a game changer for the price of raw carbon fibers. BMW 7 series (2015): Selective body parts with four different technologies (RTM, WCM, metal-composite hybrid, SMC with recycled short carbon fibers). Toyota Prius (2017): Carbon-SMC for inner liftgate structure. GMC Sierra Denali (2018): Thermoplastic short-carbon fiber truck bed. Supplier CSP announced cycle times of 60–80 seconds by applying Teijin’s Sereebo© process. The composite lighthouse projects of German, Japanese and US OEMs are shifting from RTM – the most applied process today – to compression molding and SMC processes with both thermoset and thermoplastic resins. The large amount of manual work and high material scrap rates of the preforming process are the main limitations of RTM today. Even using HP-RTM, the cycle times of the molding process can’t be lowered to less than three minutes. Short-fiber manufacturing processes could lower high material scrap rates, and thermoplastic composites could reduce molding times. The trend towards compression molding processes using thermoplastic resins is expected to continue with more BEVs entering the market. Thermoplastics have advantages over thermosets (short cycle time, recycling, etc. ), but their application has been limited due to high temperatures in ICE vehicles and creep-fatigue issues. BEVs with less critical temperature levels offer additional applications, even around the powertrain. Due to their generous design freedom and possible combination with injection molding processes, thermoplastics could reduce the number of complex assemblies significantly. At JEC 2018, Austrian machine manufacturer Fill introduced its new Multilayer system, which works with a similar concept to that of Voith’s Roving Applicator, but adds multimaterial capabilities. The Fill lay-up system is automating the preforming process and can work with thermoplastic tapes, prepreg material or dry fibers with binders as starting material. The build-up process of the preforms requires only 10–15 seconds per layer. A standard composite part with approximately eight layers would take 80 to 100 seconds and could be combined with a compression molding (tapes) or RTM (dry fiber) process afterwards. This technology eliminates material waste and the need for costly intermediate material by working directly with the dry fiber or prepreg tape – two levers for significant component cost reduction. The new system with changeable cartridges allows combination of different fiber types (e.g., glass and carbon) for further cost reductions, as the costly carbon fiber could be applied very selectively. New manufacturing technologies such as this jeopardize the classic intermediate business model and give component suppliers the opportunity to integrate backward in the value chain. Besides the classic automotive applications of structural body components and exterior and interior parts, new powertrain technologies create more automotive opportunities – composite high-pressure vessels for energy storage. According to current market forecasts, both the production volumes for natural-gas vehicles and electric fuel-cell vehicles are expected to grow significantly in the near future. The vast majority of these cars are expected to use high-pressure fuel systems with 200 bars or even more – for hydrogen cars, 700 bars is the current industry standard. Particularly for passenger cars, composite pressure vessels are the only logical solution due to the heavy weight of metal alternatives. Cost levels for pressure vessels are much lower than for structural parts, as the filament-winding manufacturing process can be automated easily and does not require expensive intermediate products. Besides the direct demand from alternative powertrain vehicles, there is indirect demand for gas transportation infrastructure, such as for transport vehicles and ships. In modern composite pressure vessels with 60 liters of H2 capacity, composite materials account for almost 85 percent – and the carbon fiber alone for 57 percent – of the approximately 45kg total weight (Source: Plastic Omnium). Hydrogen cars with typical fuel capacities of 120–140 liters of H2 today would require a minimum of 75 kg of carbon composite material per vehicle, and commercial vehicles would need even more. Even the most conservative market forecasts for NGVs and hydrogen FC vehicles promise a minimum demand of 500k CNG and hydrogen carbon composite pressure vessels in 2025 – assuming 75kg CFRP content per vehicle, this would exceed today´s global automotive CFRP demand by far. In contrast to the aerospace industry, with its long-term programs and supply relationships of often more than 10 years and extensive certification processes, the automotive industry has development cycles that are relatively short. New manufacturing technologies have the potential to disrupt the established value chain, and a breakthrough in production costs could be the end of established technologies such as RTM and specific intermediate materials. Participants in the automotive composite value chain need to quickly adapt to new situations and market developments. Strong engineering and product development capabilities are the most important skills, together with steadily keeping up with latest trends in manufacturing technologies. Necessary R&D activities and new manufacturing lines are very costly, and the automotive business is proving to be volatile and unstable. Many automotive suppliers of carbon composite parts depend heavily on single contracts, which often represent more than one-quarter of their total revenues. For financially backed and integrated component suppliers, it is easier to undertake big up-front investments and balance the volatile order intake. In recent years, Japanese raw-material suppliers Toray, Teijin and Mitsubishi have been active as investors, whereas OEM and Tier-1 suppliers such as BMW and Benteler have left the stage. Other investment-intensive technology fields, such as EV batteries, seem more promising to them than carbon composites. Expanding along the value chain makes sense for raw-material suppliers. The majority of financial value in the carbon composite value chain lies in the intermediate and component step. To reach their ambitious growth targets, fiber suppliers need to integrate downstream steps of the value chain. At the same time, they need to safeguard the sales channels for their fibers and differentiate from rising competition from China. Additionally, integration seems to positively affect overall profitability: this can be observed in the carbon composite industry in general, as most integrated players do not only supply the automotive industry. 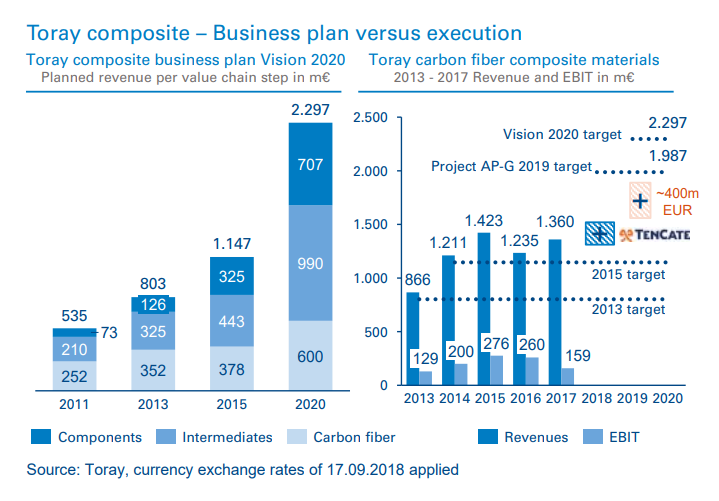 The most active integrator in the last five years has been the industry leader: Toray broadened its carbon fiber supply with industrial grades with the acquisition of Zoltek and heavily invested in intermediate producers and component manufacturers. Most recently, the company acquired the composite unit of TenCate for €930m. Toray’s aggressive M&A activity doesn´t come as a surprise. Downstream integration into intermediates and components was already part of the company’s business plan, “Vision 2020”, in 2012. Its medium-term management plan until 2019 calls for continuation of its investment strategy. In 2017 the Carbon Fiber Composite Materials business unit reported revenue of approximately €1.35 bn. The gap to reach the 2019 target of approximately €2 bn could be closed only partially with the TenCate acquisition. Direct competitors Teijin and Mitsubishi apply similar strategies. Teijin, especially, is focusing heavily on the automotive industry: the company outbid Mitsubishi for Continental Structural Plastics and recently also acquired German automotive supplier J.H. Ziegler and Portuguese composite manufacturer Inapal Plasticos. Teijin intends to transform from a material supplier to a Tier 1 manufacturer that will jointly develop its products with OEMs. Carbon composite components still are only economically viable in high-price-low-volume automotive applications. This is unlikely to change in the near future, although we will see a handful of premium and volume applications for marketing and political reasons (especially in China). We expect the industry landscape and the market to change within the next five years. 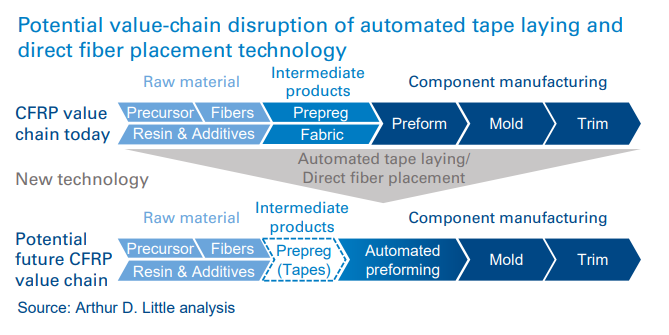 New technologies such as automated tape laying will disrupt the established automotive composite value chain and bring significant cost reductions. Huge investments in China will lower the price of industrial-grade carbon fibers significantly, and new requirements in electric vehicles will add new applications. In this scenario, carbon composites will be back in the competition with aluminum and high-strength steels. A potential early entry point to the massmarket is the very promising business segment of composite pressure vessels – if fuel cell and compressed natural gas vehicles find their way to the market. As filament winding differs from technologies currently used for structural automotive parts, we will most likely see new companies entering the market. Today, automotive component suppliers need to prepare themselves for this scenario: they must ensure material supply, secure know-how in engineering and manufacturing, be part of industry networks, and address OEMs with innovative product concepts. The automotive carbon composite business is a long-distance run, and innovations are the only possibility for achieving breakthroughs and keeping fast-followers at distance.